The DHI Global Medical Group is the first and only medical institution worldwide who offers hair transplantation from expert physicians who have obtained a specialized training certificate from the DHI Hair Restoration Specialization Course held at the National and Kapodistrian University of Athens (UOA). Available exclusively in the 62 centers of DHI Global Medical Group, the advanced DHI hair transplantation technique is the only one worldwide taught in a public university, the Eugenides Hospital of the National University of Continuing Education and Training Centre in Athens. After having successfully completed the theoretical and practical portions of the first cycle of the training program, the first five physicians from the DHI Global Medical Group have received the specialized training certificate. DHI Global Medical Group’s doctors are the first to hold a title of academic education from a public university in the diagnosis and treatment of scalp disorders. The B cycle of the academic medical education program for the treatment of androgenetic alopecia is now in progress, led by Professor of Dermatology of A.Syggro Hospital, director of clinical venereal and skin diseases Dr. Christina Antoniou and Professor Al. Stratigo. Participation in this training program is available only to physicians who wish to learn the advanced and integrated DHI Total Care System. The duration of the program is 10 days and a total of 80 hours. Upon successful completion and integration of the program, participant physicians are awarded the Complementary Education and Training Certificate certifying their mastery in training and specialization from the DHI Hair Restoration Specialization Course. 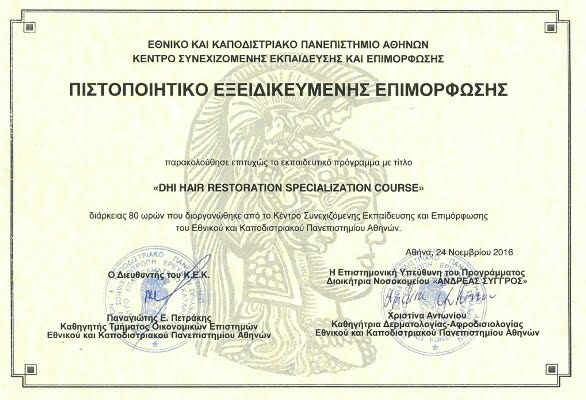 The specialization program in the treatment of androgenetic and other forms of alopecia is organized by the Eugenides Hospital of Athens and London Hair Restoration Training Academy. 15 years ago, the DHI Global Medical Group made the historic decision to become the first medical institution in the world to establish the protocol that hair transplants must be performed exclusively by physicians. This decision came at a time when sessions at other clinics were—and generally still are– performed by self-proclaimed experts, technicians, nurses and even hairdressers. In 2009, DHI Global Medical Group decided to take matters into their own hands. Realizing that an educational gap existed as medical schools did not provide adequate training for doctors wishing to specialize in the treatment of scalp disorders, DHI founded the first and only dedicated hair restoration academy worldwide in London. The highly acclaimed London Hair Restoration Academy has been in operation for seven years now and trained and certified more than 150 doctors. Today, the London Hair Restoration Training Academy is in collaboration with the National University of Athens to offer the opportunity to doctors worldwide to become trained and certified in hair transplantation at an academic level and obtain an official Complementary Education and Training Certificate in the DHI Total Care System. For 46 years, we have stayed faithful to our vision to change the world of hair restoration through our seven values: education, innovation, reliability, transparency, efficiency, care and faith in science. We are committed to our mission to contribute to the health and well-being of all patients suffering from hair loss and scalp disorders through research, education and innovative treatments. Changing the world through research, changing people’s lives! DHI Global Medical Group: The world leader in the diagnosis and treatment of scalp disorders since 1970.